My first visit to Paris was brief: just a couple of days between London and a month long assignment in Brussels. My first impression was of a city designed to dwarf humanity, with avenues too wide to cross and huge buildings with vast empty spaces between them. (My first impression of the city's residents was also less than positive. Fortunately, I've since had opportunity to revise that view.) One thing that did not disappoint: my first view of the Eiffel Tower at night. 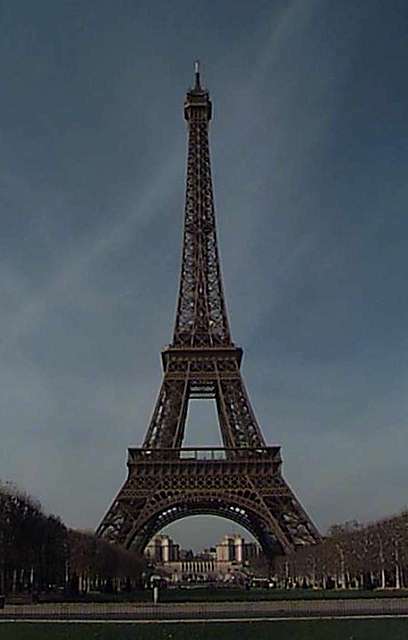 The Tower is one of very few structures that is more impressive in fact than it is in pictures. Lit up against the Parisian sky, it seems a natural part of its environment. Hard to believe that the residents of the time were shocked and dismayed by its construction and the negative effect it would have on the look of the city. My hotel on that first visit was off the Champs Elysee. Which meant that I didn't have far to go to see the only other landmark I could identify without question: the Arc de Triomphe. 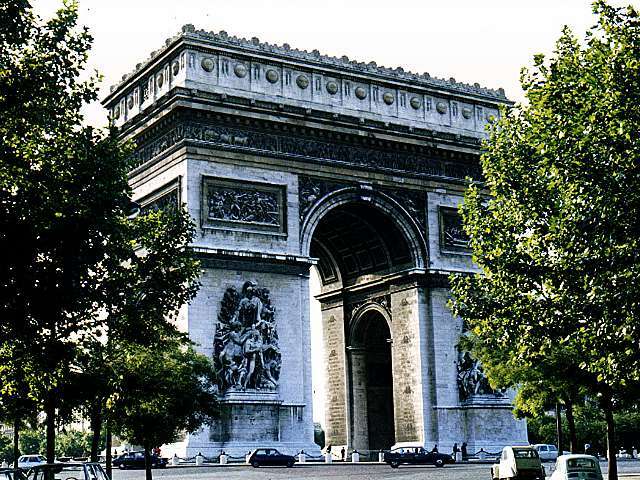 The Arc sits in the middle of the Place d'Etoile, a huge traffic circle at the intersection of the Champs Elysee and a hundred or so other roads. Etoile must be French for snarl, which is what the traffic does. And so do the drivers. My one experience driving in Paris required that I cross the Place at rush hour. Like any rational human being, I entered the circle and proceeded to follow its curve until I reached my exit. Thereby proving that I was a tourist, as the entire population of Paris cut across my path, following a straight line between their entrance and exit points. I think I was cut off more times in those ninety seconds than in my life either before or since. 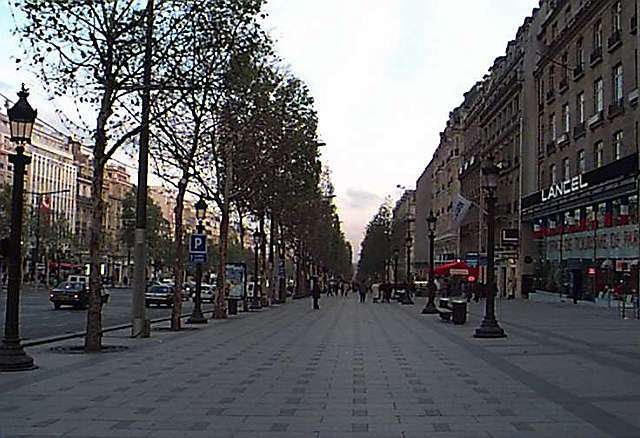 After that I parked the car and stayed to the sidewalks, which on the Champs Elysee are every bit as wide as the road. Friends told me that whatever else I might do, I just had to go to the top of the Eiffel Tower, that the views were spectacular and worth whatever hassle was involved. These images support that advice. 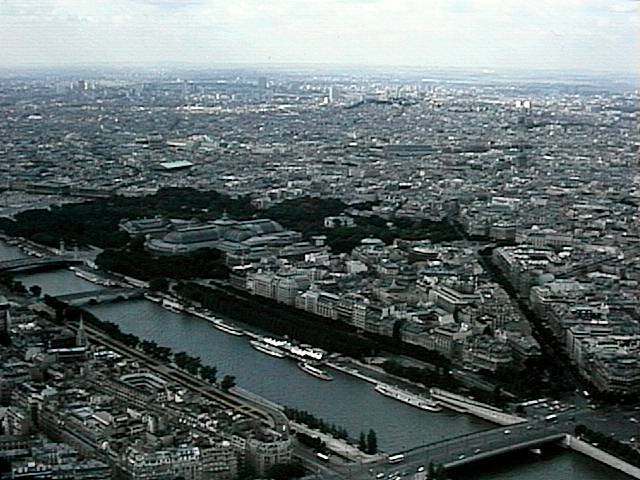 Whatever else one might feel about Paris, it is a breathtakingly beautiful city. Especially on a clear day from a thousand feet up. I've never known what to make of the French sense of humor. I'm sure they must have one, although judging by their cinema it's pretty different from our own. But any long walk around Paris leads you to the inescapable conclusion that their sense of the absurd leaves ours in the dust. 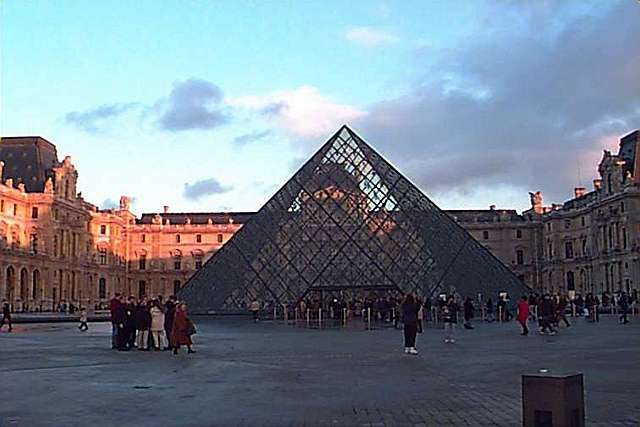 How else to explain the glass pyramid that stands in the courtyard of the Louvre? 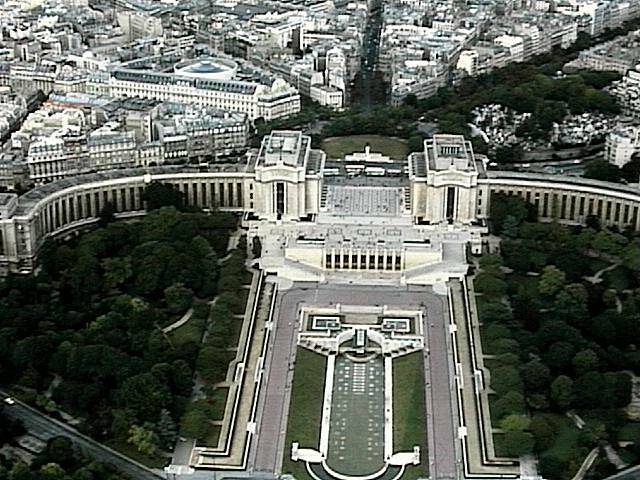 What other society would take a grand collection of monuments that runs in straight line from the Louvre through the Egyptian obelisk at the Place de la Concorde to the Arc de Triomphe and finish it off with the Grande Arche de La Défense, a giant cardboard box of a building that's missing the front and back flaps? 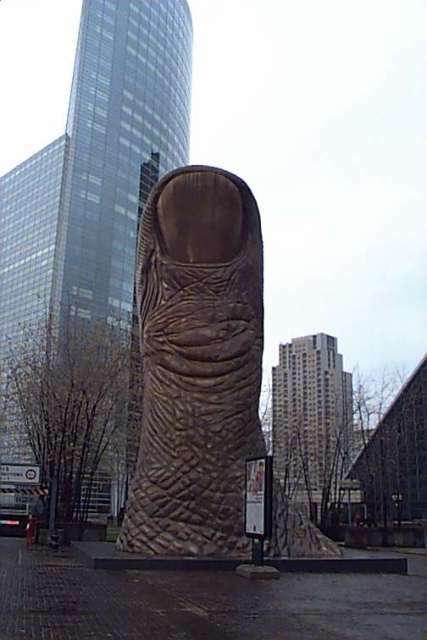 Or would pay good money for a twelve foot high bronze thumb? Now that's a sense of humor! You enter the park at the Disneyland Hotel, a remarkable confection of pink and purple. The hotel is supposed to be magnificent and one of the finest hotels in the country. 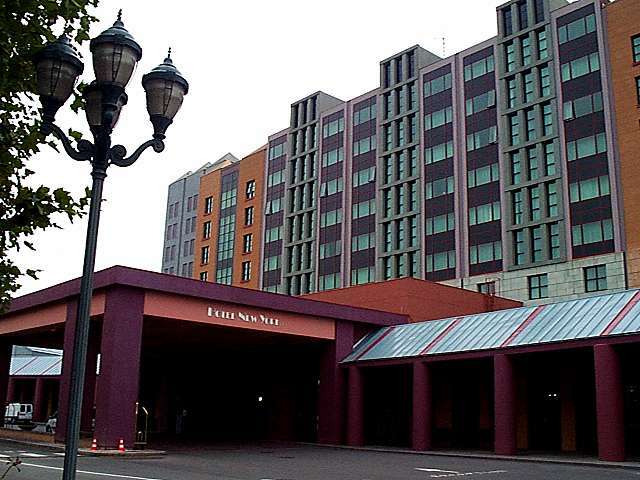 Unfortunately, you don't actually get to see inside; the entrance takes you through tunnels beneath the hotel. I never did spot the entrance. I guess they don't want ordinary tourists intruding on the ambience. 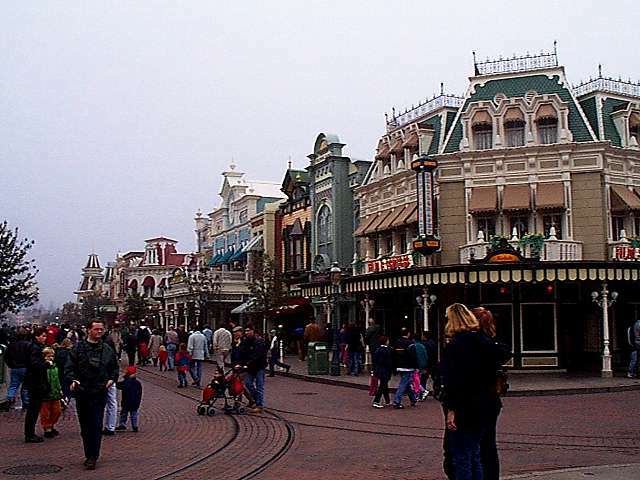 Once inside the park you're faced with Main Street, USA. At first it seems like a close recreation of the one at the Anaheim park. But I don't remember quite so much gingerbready detail on the buildings. That turns out to have been a good introduction to the park: it's like the original and then again it isn't. There are all these little details that I suspect seem familiar to the locals at the same time that they seem the tiniest bit exotic to me. The castle is another big surprise. 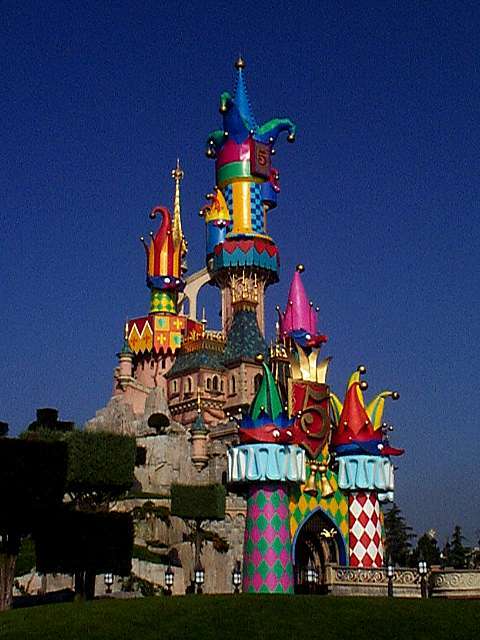 It's a lot sillier than the American versions, with its towers that end in court jester caps. Which makes me wonder: is it really less realistic? 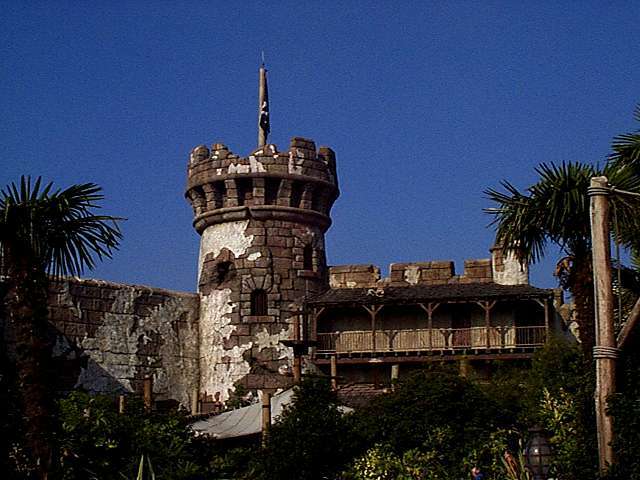 Or am I so used to the American Disney version that I think that's how a castle is supposed to look? 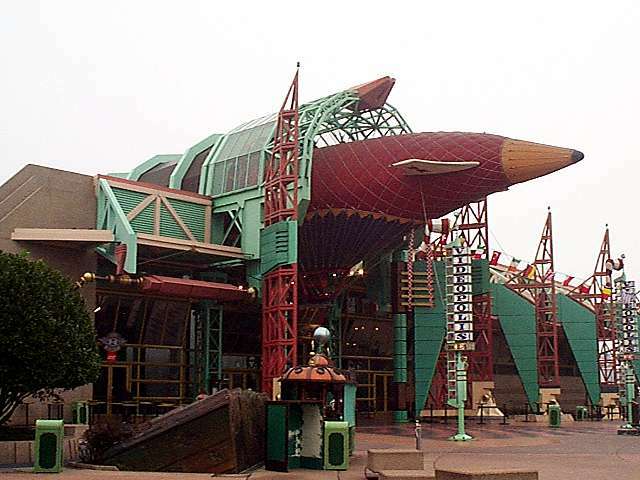 Of all the areas of the original park, Tomorrowland was the one that dated the fastest. Its view of the future was trapped in the 50s, which is not a place I particularly want to hang out. The Parisian version of Tomorrowland (called Discoveryland for what one assumes are good reasons) avoids this problem by placing itself purposefully into another age. Instead of imagining the future, it recreates a past that probably never was. Or at least it wasn't nearly this clean! 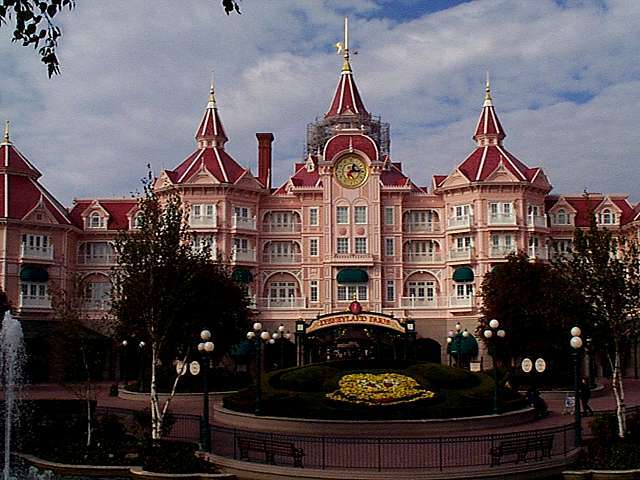 Most of the Anaheim attractions were recreated in Paris with only minor modifications. 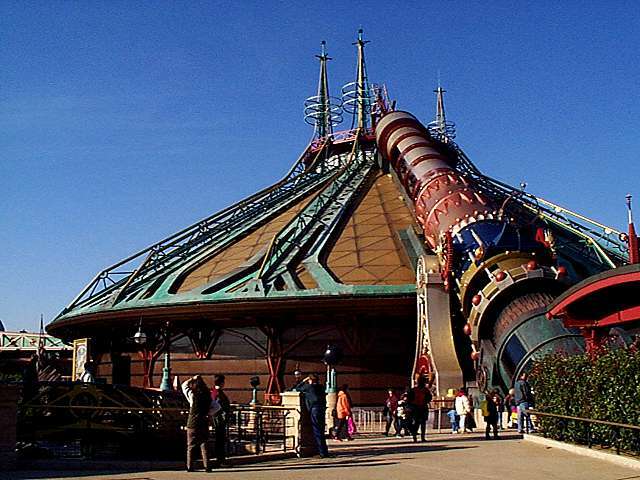 Space Mountain is the great exception. Instead of an anonymous white domed building devoted to the wonders of space exploration, the Paris version honors Jules Verne's vision of space flight as described in his 1865 novel From The Earth To The Moon. 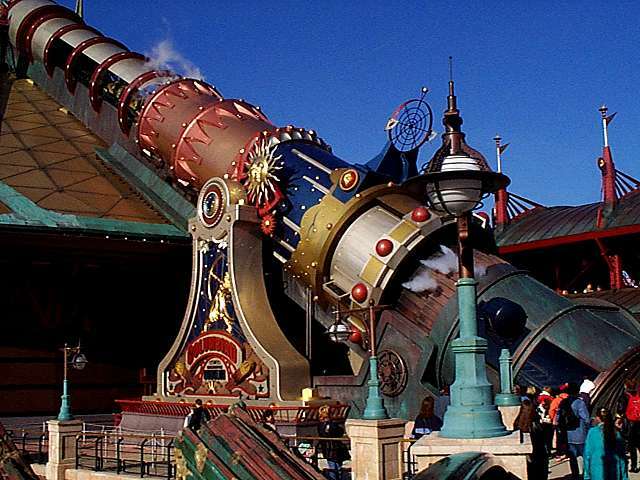 Verne imagined a giant American cannon that would launch a projectile called the Columbiad into space; Disney has created a fanciful mid-19th century launch platform. It has also built a far more exciting ride, with a 360 degree loop, two corkscrew turns and a lot of bouncing around. Most of the rides at Disney parks seem determined not to offend anyone or raise their heartrate. This is one French change that I applaud wholeheartedly. 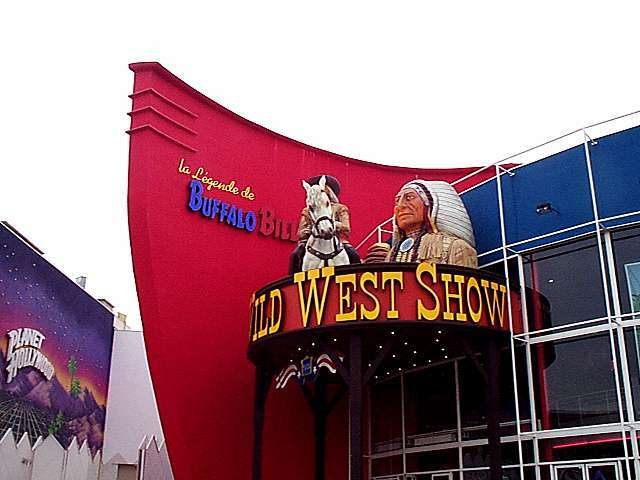 Other attractions are closer to the original, although their surroundings have experienced some nice improvements. 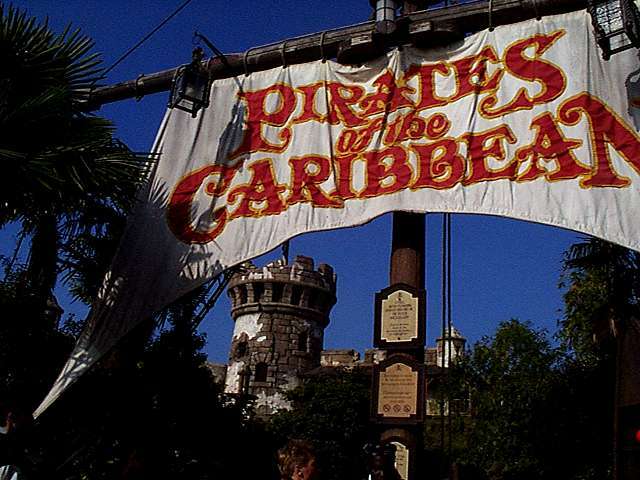 A case in point is Pirates of the Caribbean. The ride is improved in small ways, with a little more action on the boat's path. But look at what they've done to the building itself: instead of a New Orleans mansion they've built a magnificent pirate fortress. Almost makes you wish the line were slower so you could bask in the atmosphere a little longer. Certain accommodations have been made to the language peculiarities of the locals. (You mean not everybody speaks English?) 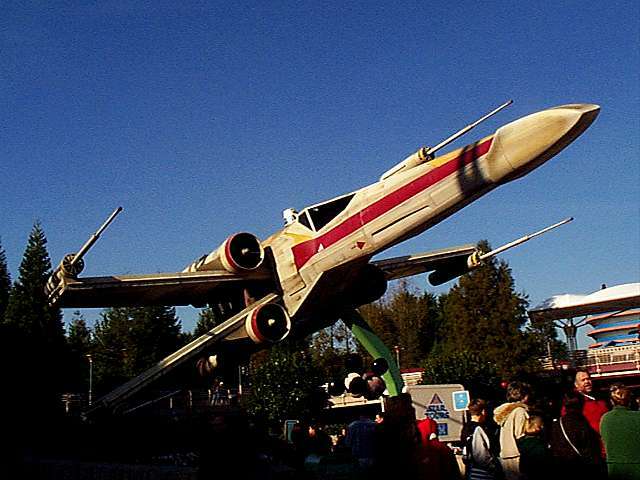 My favorite example is Star Tours. The flight announcements in the waiting area are in French and English. The various robots speak one language or the other. C3P0 even chastises R2D2 in French. (Why not? We know he speaks bocce.) But the best part is the ride itself. Captain Rex the robot pilot converses en français with the rebel pilots, who all respond in English. That's sort of consistent with the movies, where all the weird creatures speak bizarre alien tongues and all the people speak English. Does that mean that the French are aliens in their own country?